2012 was my first year where I didn't have to focus my efforts on weight loss. Here’s a summary of my year. The year started off slowly. A couple of weekend rides and swimming once a week and running 2-3 times a week. I signed up to Gareth Rowbotham's (@curesam) #12xIronMan Challenge. The challenge is to complete the distance of an IronMan triathlon every month in 2012. That's 2.4 miles of swimming, 112 miles of cycling and 26.2 miles of running. I thought I was well within my abilities to complete this so when I was asked to take part I said yes. Took part in the local parkrun. It's an organised 5k run every Saturday at many locations throughout the world. I even volunteered as a marshal. Had a go at Rollapaluza for the second time. For those that don't know what Rollapaluza is, two cyclists battle it out on a pair of custom rollers connected to a huge dial over a simulated 500m distance. My time was 25.13s. Average speed 44.8mph. Average cadence 180.9rpm. Peak power 807w. I was pleased that I wasn't the slowest and I was just over 2.5s faster than my time last year. It's really tough but good fun. March is the anniversary of when I started cycling. In two years I'd lost 8.5 stone and ridden almost 9,400 miles. To commemorate the anniversary and to try and promote the Cycle to Work Scheme I created a video to tell my story. It proved extremely popular over the year being viewed 8,412 times. I also received positive feedback from all that saw it. Hopefully it's inspired some more people to do what I've done. I also took part in the Burgess Hill Springtime Classic. 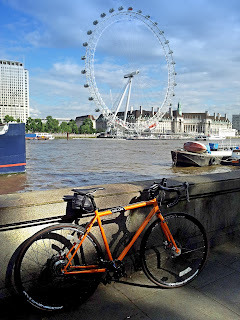 It was my first proper cyclosportive and was organised by SRS Events. It was a well organised event. However being early in the year my ability didn't live up to my expectations and the 71 mile ride was a killer. Harder than I expected. April saw me take part in the 30DaysofBiking again. For those that aren't aware, the challenge is to ride your bike every day for the whole of the month. Although I'm an avid cyclist, getting on the bike every day, whatever the weather can still be a serious challenge. I was able to take my bike away with me on holiday for a week and got to explore new places on two wheels. 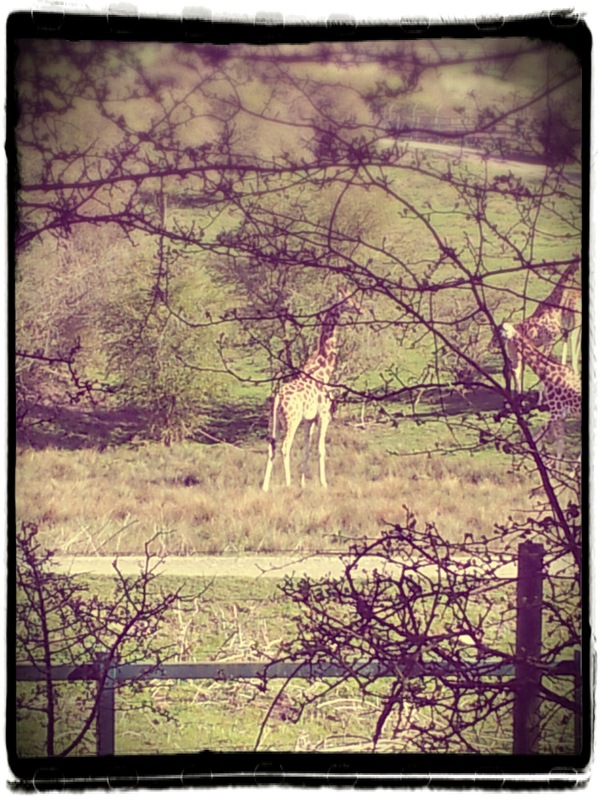 I even saw some giraffes on one of my rides. However, I ended up having to miss a couple of rides. I'm pleased with what I achieved though. This was a busy month. I finished servicing my Specialized Allez Road bike, I'd taken it off the road after the Burgess Hill Springtime Classic and took time to strip it down, thoroughly clean and replace any worn parts. 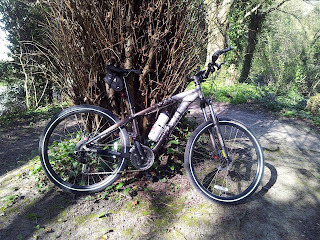 The bike was like new when I'd finished, even if it'd taken me 2 months! I took part in the Uckfield Sprint Triathlon. The distances were 500m swim, 16km bike and 3.5km run. I was pleased with my performance on the day and it was only my second triathlon. 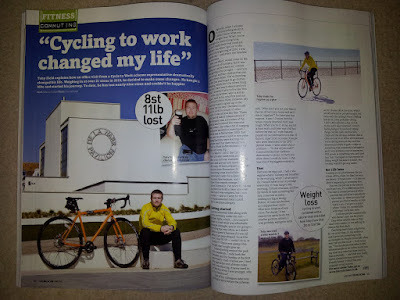 I was featured in Cycling Active magazine. They'd contacted me after seeing my video. I felt like a minor celebrity and for the first time, revealed my blog to colleagues at work. Up until now I'd kept my online identity a secret. I took part in the London to Brighton Bike Ride for the third time, raising money for the British Heart Foundation. 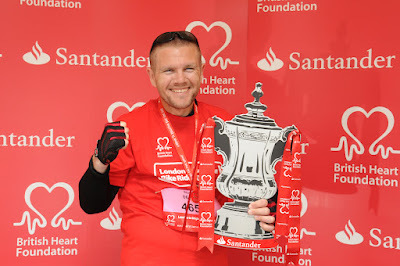 I was an ambassador for the BHF and was interviewed on BBC local radio and TV. I made a trip to the new Cyclopark facility in Kent and took two bikes with me. 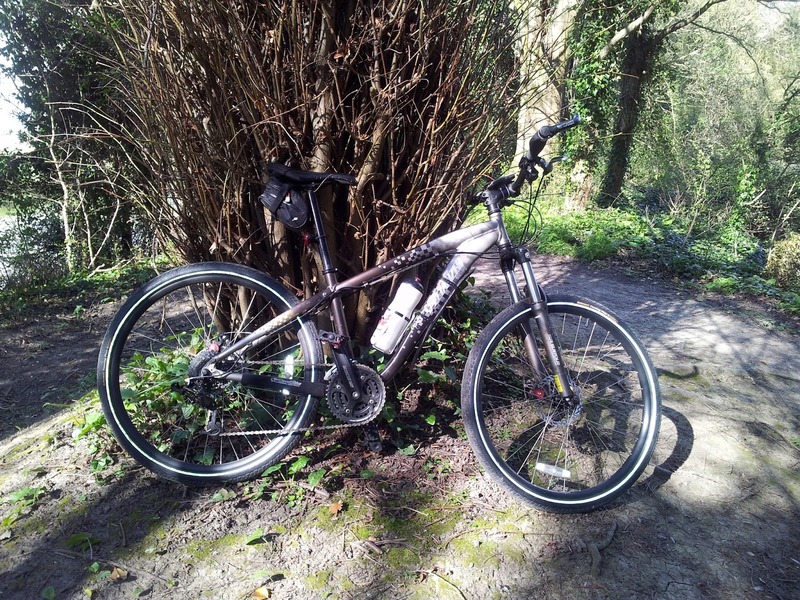 A road bike and a mountain bike to try out the different terrains available. I also made a second video. This time it was about triathlon and titled '21 stone to triathlete'. I used it to persuade a friend of mine that's very competitive but does almost no physical activity to take part in a novice triathlon. It failed in that respect but I got very positive comments from all those that saw it. The first half of July was void of anything memorable. The second half started off with the Pasty Ride 2012 with fellow bloggers Matt, John, Pete and new this year, one of Rafe's neighbours. I started a bike build project with my eldest son. I bought him a mountain bike frame with the intention of building it up over the summer holidays. 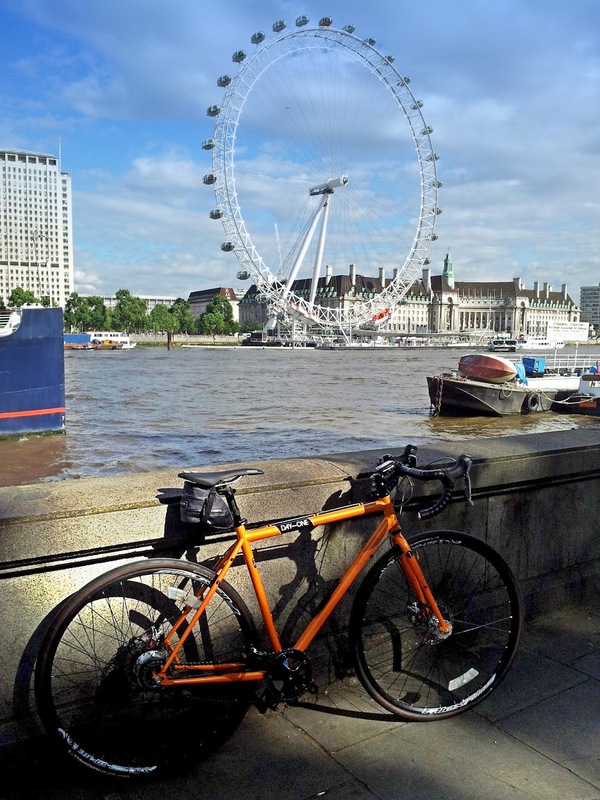 I took one of my bikes with me to London for the day. A very memorable way to get around the capital and the weather was fantastic. Then there was the BHF Goodwood Cycle Ride at the famous motor circuit which I took part in with my family. I did a total of 20 laps around the circuit and my family all matched or beat last years efforts. The month was finished off by going to see the Mens Olympic Road Race. I went up to Dorking in Surrey with my family and saw the riders whizz past. We then walked along to the Surrey Hills Road Race Festival. I got to meet up with Pasty Ride Pete again. We also got to see the rest of the race on a BBC big screen. I got the chance to go to the Olympics properly this time. I had tickets for the Women's Olympic Mountain Biking at Hadleigh Farm in Essex. It was a great day and the weather was perfect. I took part in the Ringmer Triathlon for the second year. This time I did the sprint distance rather than the novice. The run was much harder than I expected and my time was much slower than I thought it should be. It was a hot day but I know I have more in me. I took my bike with me on holiday again. This time I got to ride around Devon and Cornwall. It's great exploring new places by bike. For the first time, I did London to Brighton twice in a year. However, this month it was off-road. I expected it to be tough but with 20 more miles than the other and not much smooth tarmac it was a real killer. I'm so glad I did it and want to do it again in 2013. I took part in the Tour of Britain Challenge Tour Ride and afterwards went to the Cycle Show exhibition at the NEC in Birmingham. I won two places on the ride and invited John along to keep me company on the 96km route through the Midlands. We then visited the Cycle Show and met fellow cycling blogger Phill. I also got to meet Olympic cyclist Lizzie Armistead. Although not cycling related, I went to the Lake District and climbed the two highest mountains in England, Scafell Pike and Scafell. I've never done anything like this before. It was amazing and much more physically challenging than I was expecting. 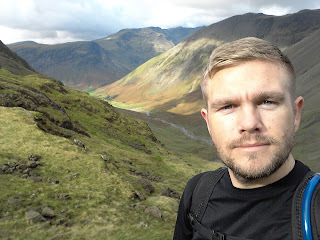 For 2013 I'm taking part in the 3 Peaks National Challenge. I took part in the Rye Rotary Ride. I chose the longer 100km ride which starts in Rye, heads to Dymchurch and goes back via Appledore. It was tougher than I expected it to be seeing as the ride is completely flat. November saw my 34th birthday. Other than going mountain biking once around Bedgebury Forest I didn't get up to much for the month. I got a new bike light. A Lezyne Super Drive XL. Very bright. Exactly what I needed for the unlit sections of my commute. In the final month of the year I didn't do much at all in the way of extracurricular riding. I rode my mountain bike around the forest once but that was it. It was also the only month I did no running. It was a busy year, even though I didn't do as many miles as I'd hoped for. My weight stayed reasonable steady over the year. It only went up or down a handful of kilos. My blog saw 14,005 visitors in 2012 (92.88% up on last year) with a total 35,848 pageviews (46.57% up on last year).